FIRE! : Fanning The Flames Of Mediocrity – Schlockmania! Flood! was the first television-sized disaster flick for Irwin Allen but it certainly wasn’t the last. In fact, it was produced back-to-back with Fire!, another made-for-t.v. effort utilizing the same director (Earl Bellamy) and some similar Oregon settings. As you might expect from these origins, the second film has a definite ‘more of the same’ feeling but the results are slightly better than its predecessor. As with Flood!, nature once again rebels against mankind for its carelessness. 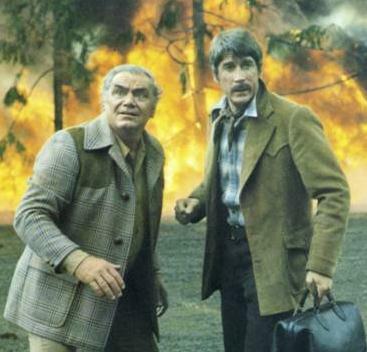 This time, a forest fire is sparked by Larry Durant (Neville Brand), a scheming work-detail prisoner aiming to create a calamity that will allow him to escape. Unfortunately, he’s way too successful and soon a nearby town is in danger. Other characters/potential flame-fodder include nice-guy lumber mill owner Sam (Ernest Borgnine), lodge owner Martha (Vera Miles) – who Sam is in love with – and a pair of married doctors on the verge of divorce, Alex (Alex Cord) and Peggy (Patty Duke). Additional subplots include a teacher (Donna Mills) who loses a kid in the blaze during a field trip and a wrongly-convicted prisoner (Erik Estrada) who wants to escape. Fire! has a lot of the same problems as Flood! : the budgetary corner-cutting inherent to a t.v. project limits the amount of excitement and the script shamelessly pads itself with gratuitous soap-opera melodrama and stock characterizations. Some the latter element can be fun – the early, bitchy scenes between Cord and Duke are campy enough to prompt a few chuckles – but it quickly sets in that all the jabbering between these cardboard characters is a distraction from the fact that there wasn’t enough money in the budget for any epic-scale destructive setpieces. It’s also annoying that several plot threads in Fire! are left hanging due to the limitations of its t.v. movie time slot: for instance, the ultimate fate of Estrada’s prisoner character is never resolved despite getting a lot of screen time. There’s also a ridiculous denouement to the Borgnine/Miles romantic subplot: without getting into spoilers, it’s a misguided attempt at melodrama that tries to tug several different heartstrings in the space of a minute and it ends the film on a note of unintentional hilarity. On the upside, Fire! benefits from a little more carnage than its predecessor. 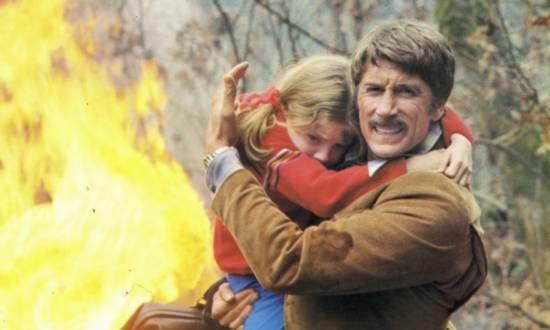 It’s cheaper to shoot fire stunts than try to simulate a flood so there are periodic scenes of people on fire running around and screaming that will keep the viewer awake (these moments conjure up fond memories of the “Irwin Allen Show” sketch from SCTV). Earl Bellamy’s direction fares better this time as there is more action to choreograph. Finally, and most importantly, Fire! thoroughly benefits from the presence of Ernest Borgnine. He delivers a professional performance, never condescending to the limp material and always giving the proceedings his all. That said, Fire! 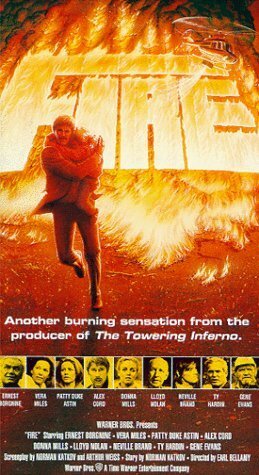 is ultimately minor stuff on the disaster movie scale: better (and shorter) than, say, When Time Ran Out but nowhere near as entertaining as its obvious model, The Towering Inferno. It’s fairly painless when compared to Flood! and the Irwin Allen completists should find it moderately amusing – just don’t expect too much.